From the original 189 applications for entry the A.C.O. selected a most promising field, but pre-race withdrawals (most notably of all the American cars, Chevrolet Sting Ray Corvettes and Chaparrals, and of the works Abarths the A.S.A.s and the new Osca) removed much of the piston-engined novelty. Even with all the reserves admitted, the smallest field (48+1) for several years started. Ferrari was once again the marque to beat, a formidable task as 11 factory and private cars represented the Scuderia, four 4.9 330LM open and coupe Prototypes, three open 3.0 250Ps and four 3.0 GTOs (one a 330LM/GTO hybrid). Their large-car opposition included only two full teams, neither of them full-time: Briggs Cunningham's three lightweight competition E-type Jaguars and the Aston Martins, a 4.0 215 Prototype, a private and two works DB4GTs. One new sound on the circuit was the beat of American Ford V-8s, installed in two A.C. Cobras as "slow" (about 160 m.p.h. maximum) as the Jaguars on the Straight, and a rear-engined Lola G.T. Prototype, which started despite its late arrival for scrutineering and the extensive modifications subsequently required. A 3.8 Lister-Jaguar and the modified (simplified rear suspension and 5.0 V-8 engine) Type 151 of Maserati-France completed the "big" entry. A lone M.G.B. faced four 2.0 Porsches, two Prototype flat-8s and to 2000GS fours. Two Sunbeam Alpines and a 1.6 Alfa Romeo made up the next class; two Lotus Elites and two Alfa Romeo Giulia GZS the 1300c.c. class. Rene Bonnet and an Austin Healey formed the 1150-c.c. class. A Deep Sanderson joined three elongated but pretty 1 litre Alpines and two elongated Bonnets. Two smaller Bonnets, two Fiat-Abarths and a scruffy DKW Special made up the "conventional" field. Finally, racing with the others but only against the clock to average 93.2 m.p.h. as a formula equating its power unit with piston engines could not be agreed, was the Rover-B.R.M. gas turbine car, the first so powered to run in a classic road race and naturally a centre of interest. Breaking with tradition it was flagged-off individually from a facing-direction-of-race not tail-to-pit position. The field got away cleanly on a hot afternoon. At the end of the first lap Simon in the Maserati boomed past in the lead and during the opening stages, he fought off the Ferraris of Parkes, Surtees and Rodriguez. The new Aston Martin, after an excellent start, fell back slightly but kept in touch with the leaders. But troubles came early. The DKW completed only one hesitant lap, a Fiat-Abarth two, while a Lotus and the M.G. embedded themselves in the Mulsanne sand, while a DB4GT made a pit stop. Then Masson rolled his Bonnet down the centre of the approach to the Esses in front of the tight leading group which was about to lap him. 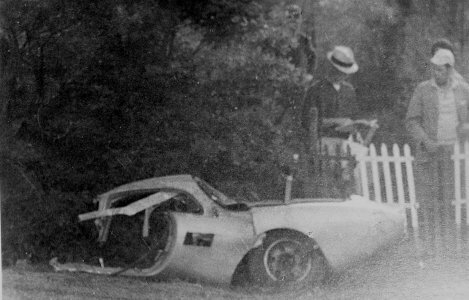 They all avoided the wreck but Phil Hill, fifth in the Aston Martin 215, hit fragments of the Bonnet and also incurred transmission damage which ultimately caused his retirement. In their pursuit of Simon, Rodriguez and Surtees broke the lap record again and again, Surtees finally cutting four seconds off the existing record while the average for the first two hours was only fractionally under 200 km/h. The big Maserati gained a few laps respite during the first Ferrari stops but slowed during the third hour and went out with transmission failure. Ferraris now commanded the race. 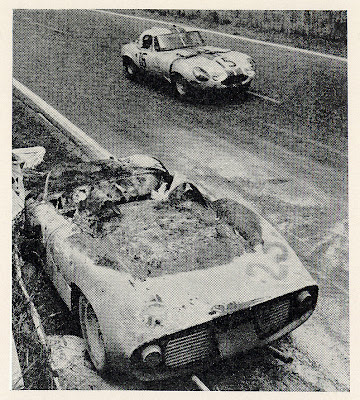 The gearbox trouble which had already put the Hansgen-Pabst Jaguar out slowed the Salvadori-Richards sister car. Just past 8 PM the engine of Bruce McLaren's Aston Martin let go distributing a generous quantity of oil in the fast corner just after Hunaudières. First to hit the oil was Roy Salvadori in the Briggs Cunningham entered Lightweight Jaguar E-Type. Salvadori lost control, briefly regained it but then ran onto the grass and spun. He hit the bank backwards and, with his seatbelt undone as he had been having problems with it, he was ejected though the rear Perspex window onto the back. The car caught fire but was quickly extinguished and Roy survived miraculously with just cuts and heavy bruising. 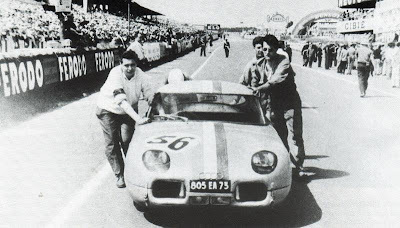 Next to arrive at the scene was 'Franc' (Jacques Dewes) in the Aston-Martin DB4 GTZ. 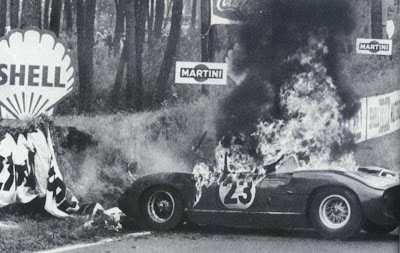 He spun but managed to avoid hitting anything though the René Bonnet Aérodjet LM6 of Jean-Pierre Manzon crashed whilst trying to avoid him. Manzon was thrown out when his car rolled leaving the hapless Christian 'Bino' Heins with few options. In avoiding Manzon, who was lying on the track, he hit the oil and spun, hitting the LM6 and a lamp-post. The Alpine-Renault burst into flames with Christian trapped inside. The fire-fighters struggled with the fire out as they tried to get Bino out of the car. He was taken to hospital but was declared dead on arrival. A post mortem revealed that he had probably died almost instantly from head injuries. The Surtees-Mairesse 250P extended its lead through the evening and at midnight had completed 117 laps averaging 197.6 km/h. It was followed by Bandini-Scarfiotti (250P, 116 laps), Rodriguez-Penske and Gurney-Hall (N.A.R.T. 4.0 330LMs, 112 laps) the former about to retire with an oil leak, and the surviving Aston Martin (Kirnberley-Schlesser, 112 laps). Meanwhile, the unobtrusively consistent Rover-B.R.M. had covered 103 laps and was as fast as most cars through, for example, the Esses, thus dismissing pre-race suspicions that it might be a mobile roadblock. The Aston Martin climbed to third before retiring in the early morning, turning the Barth-Linge Porsche in seventh place into the first non-Ferrari and the Grossmann-Cunningham Jaguar, eighth, the highest British car. Speeds fell considerably as the Sarthe mist lay thick on the circuit. The Lola lost over two hours with gearbox trouble, returned to the race but soon rolled in the Esses as the gearbox selector failed again. Car after car had fallen out so that by 9 a.m. there were only 17 runners. 8 Ferraris, 2 Bonnets, a single A.C., the M.G., an Alpine, a Porsche, a Sunbeam and a Lotus. The remaining Jaguar was stationary at its pits while its front (mangled when Grossmann took the escape road at Mulsanne after a pin in the brake pedal linkage snapped), was rebuilt with cannibalized parts. 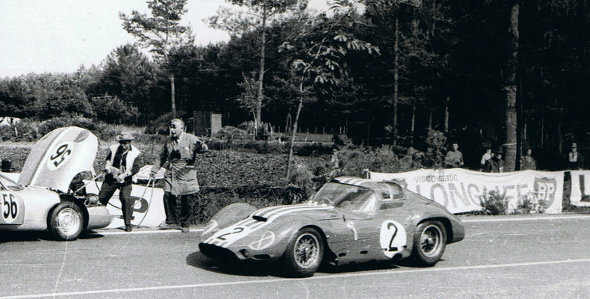 At 18 hours the average speed of the leading Ferrari was 196.3 km/h but at 10.40 a.m., immediately after a refuelling stop, it caught fire and Mairesse spun it in the Esses before abandoning. But still six Ferraris led with remarkably few small cars left to impede their progress, and the Rover-B.R.M. was (unofficially) eighth. The Porsche had slipped several places after losing a wheel. By 1.40 p.m. on Sunday the gas turbine car had completed its target distance. Of the big cars only the Gregory-Piper Ferrari, which had been in the sand at Mulsanne, really hurried to regain lost places as the race ran out. Ferrari won as expected but the extent of their victory could hardly have been forecast. Their demonstration of speed and endurance was the more outstanding because of the failures of other marques. 5 out of 11 Ferraris retired, only three of them with mechanical derangements. 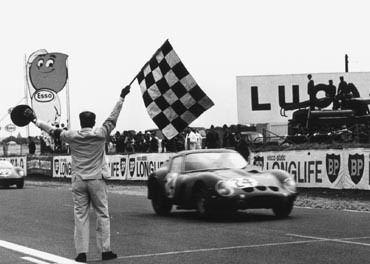 They equalled the Bentley and Alfa Romeo record of four wins in a row quite apart from gaining their seventh victory. The winning car covered more than 4,500 km. for the first time, took the Index of Performance award away from the small cars for the first time since 1950 (the Beltoise-Bobrowski Bonnet was a lowly seventh), and was second to the Bonnet in the Thermal Efficiency classification. It was also the first all-Italian-car and drivers-victory at Le Mans. The first basically-new car in road racing for decades and attempted forerunner of a new era that still has to come, the Rover-B.R.M. performed superbly and would have won any Le Mans 24-hour Race before 1957. Graham Hill, Ginther and the mechanics were greeted by the loudest cheers of all at the conclusion of a triumphant demonstration.